Did you ever wonder How do bloggers make money? Gone are the days when blogs were only an online diary. Today, there is a startling amount of money to be made online from blogging and I’m here to answer that question “How do bloggers make money?”. Bloggers make money with affiliate marketing. In case you didn’t know affiliate marketing is selling other people’s products for a commission. Affiliate marketing is so great because you don’t need any product inventory, you don’t have to do any of the work and just talk about other people’s products and get paid. I broke down what affiliate marketing is into the simplest of terms. So to be really successful like Michelle Schroeder Gardener who made over $150,000 in March in affiliate marketing you will need to study. I don’t believe Michelle has made less than $50,000 a month in affiliate income in years. If you would like to learn Michelle’s affiliate marketing method check out her course Making Sense of Affiliate Marketing. I took her course and it’s packed with valuable information. I’ve been making affiliate money ever since. Sponsored posts are when a company asks you to write about a product and you get paid for it. The key to a sponsored post is to write about a product you believe in and benefits your readers in some way. You don’t want to be fake and write about a something that is garbage and not a good product. There are different ways bloggers can do sponsored posts, they can go through a company directly or through an influencers network. An influencers network is a network that matches a blogger or influencer with sponsorship opportunities. How Do Bloggers Make Money With Influencer Networks? Bloggers make money with influencer networks such as Tapinfluence. You sign up for the network, connect your blog and networks, and they tell you how much they will pay for sponsored posts, tweets, instagram posts etc. The larger your reach as a blogger and influencer, the more you get paid. If a blogger contacts a company directly he cuts out the middle man. By checking what you are worth on an influencer network like Tapinfluence, you can get an idea of what to charge when you contact companies directly. *Hint* That amount you charge should be higher than what you are worth on the influencer network because you are cutting out the middle man and his cut. How do bloggers make money doing product reviews? Bloggers make money doing product reviews by either getting paid to do the review or in exchange for the product itself. When I did product reviews, I would often ask for an extra product to do a giveaway. I wanted to benefit my readers as much as possible. I often was given very expensive products to review and I was happy to do a review and a give away without compensation. The product always directly related to my niche and was something I really wanted to own. I could also receive compensation for doing a product review, but that is basically a sponsored post. Some of the companies products I would review were just starting out so I felt the price of the product and by allowing me to have a second product have a give away was sufficient. That’s the beauty of being a blogger, you set your rates, you do what you feel is best for your blog and business. Bloggers don’t want to damage their reputations so they like to keep those product reviews honest. Product reviews and giveaways are great ways for bloggers to build their readership. More readers = more money in other areas like affiliate marketing. If a blogger has a giveaway and does a product review, they can also be an affiliate for that product, and make money that way too. Bloggers can make money by charging for premium content. They can have a membership site where they only give their best content for a monthly fee. Premium content is a great way for bloggers to make money while adding value to their readers. This type of setup is great for bloggers who are in any type of educational niche. They create highly valuable content that they charge extra for. Any type of niche can have premium content as long as it adds value for their readers. Lets say a blogger has 2000 members for their premium content, and they charge $25 per month. That’s $50,000 a month. Not bad. Not bad at all. Kind of makes you want to quit your day job huh? People tip for coffee, why not tip a blogger? Bloggers can create a tip jar with PayPal and make a couple of bucks. Depending on how many visitors their blog gets, how generous the readers are and how good they are at soliciting tips, a blogger could make a lot of tips. Some bloggers can make money by charging for consulting and coaching. Being a life coach sounded like some crazy far out thing just a few years ago but today many successful people use and employ a life coach. There are many bloggers making great money charging for services. Sure you can make money from consulting and coaching but it’s not passive income. This means you have to actually show up to do the work and get paid. You can’t “set it and forget it” like other ways bloggers make money. But consulting and services are still a great money-making option for many bloggers. Design – such as logo or web design. Perhaps even a blog banner or an ad. Coaching – any type, weight loss, success coaching, you name it, there is a coach for that. Consultations – A blogger can be a consultant for any niche. Starting a blog, branding, SEO, site design, etc. These are just a few services a blogger can make money doing, the sky is the limit. Services can be a great way for bloggers to make money. Especially if they hire out the service part of the blog. You can hire someone else to do the service. You can match the person you hire with your clients and that cuts down your workload. Hiring out services also gives someone else work and your clients get what they wanted. How do bloggers make money? Bloggers make money with courses. The beauty of online courses is that you can create and sell your own courses as a blogger or you can sell someone else’s course as an affiliate. Courses are a great way to supplement your blogging income. If there is a subject that a blogger is an authority in, that’s a perfect course for them to teach others. If creating a course isn’t your jam, don’t give up on the idea just sell someone else’s course. I have no desire to create my own affiliate marketing course. I believe that Making Sense Of Affiliate Marketing is fabulous course. Because I believe it in so much I promote it myself as an affiliate. Having already taken the course I have gotten and I still continue to get results. Singing the praises of this courses comes natural so being an affiliate makes sense to me. To be an affiliate of this course makes more sense than creating my own affiliate course to sell. You can start out selling other people’s courses as a blogger and then eventually sell your own too! Would you like to know how bloggers make money with ad networks? This revenue stream can be tricky to do well. Don’t get too carried away with ads or it will completely destroy your site. On the blog Making Sense Of Cents Michelle Made $3092 on display advertising last month. Times that by 12 and you have $37,104 and that’s not too shabby. She keeps her ads minimal so they are not too distracting. I referenced this particular site because not only is she is one of my favorite bloggers but she has one of the few sites that the display advertising doesn’t make me click away. Bloggers with a very high number of page views can make this type of advertising lucrative. If you don’t get traffic and no one clicks on your ads, you don’t get paid. With ad networks you are paid a fixed price per click and you don’t control what ads appear on your site. Selling ad space is a great way for bloggers to make money. Unlike with ad networks, you can control exactly what ads appear on your site. You can control what the ads look like in your ad space. You control how long they will be there and how much you will charge for that ad space. Selling ad space is like having a little billboard on your site. I used to do this type of advertising on one of my blogs and it worked out great. I made sure that the advertising was useful to my readers and not annoying. It was a win/win situation for sure. Bloggers can make money by finding jobs on a job board. The beauty of a job board is that you can make money even if you don’t have a blog. This can be a great experience for a new blogger. An experienced blogger can make even more money from job boards. Blogging boards are a great way to gain exposure and supplement your income. Job boards hire all different types of bloggers for any kind of blogging job you can think of. Bloggers can make money from selling products. This is actually my favorite way to make money blogging. I love being creative and creating and designing products are my favorite things to do! Bloggers can sell physical or digital products. I sell digital products. I sell buildable blogging planners. Bloggers buy my products, print them out and insert them into their planners. The difference between my planner and other planners is that it is for bloggers. 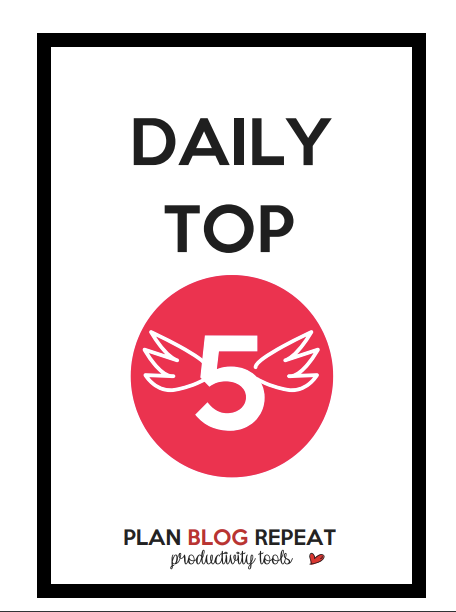 My planner helps bloggers organize all of their blogging tasks, goals, and dreams. If you would like to organize your blog check out my Buildable Blog Planners . I have many blogging products currently in development so keep checking back! Just like with investing, bloggers should never depend on only one stream of income. Above all, if a blogger can mix up multiple streams of income, consequently they can pretty much bulletproof their pay. How do you make or hope to make money blogging? Let me know in the comments I would love to hear from you. What a terrific post. It’s packed with information that a Blogger can use to monetize their Blog. While I knew about how influencer’s can earn money I did not know about ‘TapInfluence’. I checked out their website and did a quick search in Google for sites like TapInfluence. Boy was I surprised at what I saw. I’m definitely going to study this space more carefully than I had done before. Here are some interesting sites my Google search turned up. Here’s something specific to Instagram that I found fascinating. Speaking about premium content being leveraged for income using a membership, what’s the level of success you’ve had in this space? I’ve been mulling over this for some time without being able to reach a firm decision. Your input may be my tipping point. This was something that I learned the hard way a long time ago when a profitable venture suddenly went bust leaving me without an income stream for several months. Superb article. Very well laid out, absolutely easy on the eyes when reading. Thank you for the thoughtful and insightful comment. I love the idea of marketing on Instagram. It’s like a microblog in a way. I started getting more interested in Instagram lately and I’ve recently started trying to grow my following there. In response to your paid membership question, it’s something I too had been mulling over on my other blog and did not end up doing it. I should have done it and I regret that I didn’t. It would have been a perfect match for myself and my audience. What I was planning to do was video and printable lesson plans in the premium content. I say if you have been contemplating it go for it! You will then have no regrets. I regret a lot of missed opportunities I had with my previous blog but I am now older and wiser. Thank you again for your very encouraging comment! I love it! Very good material and advice for people just starting out!